Thank you to my Aunt Deb who surprised me by getting tickets to go to dinner and see a live taping of “The Cooking Show” at The Rustic Kitchen Bistro & Bar in Boston tonight. I’ll be the complete DORK in the audience taking pictures of her food. (Seperate blog post to come about that.) I’m so excited to spend quality time with my auntie, eat good food, drink good wine and maybe pass out some blogger cards. Opportunity beckons. Thank you to BU’s College of Communication for giving me a $10,000 scholarship to help me pay for my Master’s Degree program. Without it, I’d be slightly more panicked. Thank you to Claire for being in the Royal Wedding spirit today. 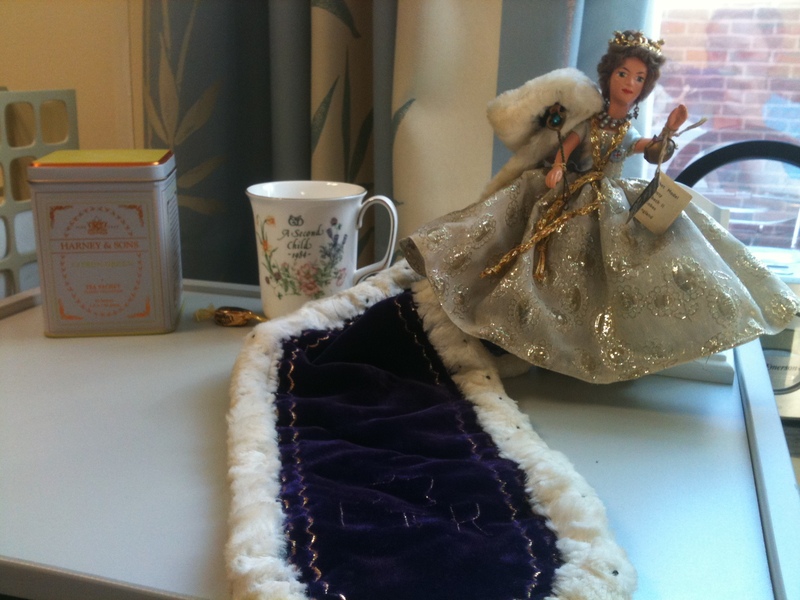 Not onlydid she don a tiara all morning at work but also brought in a Queen Elizabeth doll, English tea and a teacup from 1984. Classic. Thank you to Shazam for being able to capture any song on the radio so I know it’s title and artist instantly. Have you heard Lifehouse’s new song “Falling In”? If not, download it. It’s Stephen’s new ring tone. Thank you to this weekend. Lots of working out, some healthy cooking, maybe a bike ride, a trip the Newburyport farmer’s market, time with the family and the boyfriend, lots of sleep, wine and relaxing. As a kid, I always loved pizza and french fries. That’s probably explanation why I was a chubba growing up. French fries were side dish staple to any kid’s meal, my favorite being McDonald’s. As for pizza, well, let’s just say that even my 14-year old self could put away a couple of decent sized slices. Nowadays, I no longer eat fast food and pizza is a fleeting indulgence, eaten sparingly and in small amounts. So how do I satisfy even the worst junk food cravings? I make my own. I spend a lot of my time scouring the Hungry Girl website and cookbooks for healthy ways to make over my favorite foods. She has a zillion pizza recipes and a few takes on fries as well, all without the guilt (and tighter pants) that come from the originals. Last week, when boyfriend and I wanted pizza and fries but I didn’t want take out, I pulled out HG’s book and went to work. Butternut squash fries are by far one of my most favorite recipes ever. It’s not really a recipe, even, just a few simple ingredients and your oven set at a high temp. Butternut squash has a similar starchy quality to potatoes without being loaded with calories. I like to buy b-nut squash halves that are already peeled and de-seeded because it’s easier, but if you want to have a knife fight with a whole one, I wish you the best of luck. Now, onto the pizza… Portobello mushrooms have always been high on my list of favorite foods but is something I don’t eat all that often. I have no explanation for this. Nevertheless, they are the “crust”, if you will, to my pizza and along with a few other things, I think the meaty texture and taste of the ‘shroom makes it even better than its traditional counterparts. Try it if you don’t believe me. Oh, and these babies are so low in fat and calories, that Stephen and I ate 2 each. You can’t beat that. Preheat the oven to 425 degrees. Carefully cut your squash into fry shapes (you could also use a crinkle cutter like this one…) and sprinkle with salt. Serve with ketchup or any other favorite condiment! Remove mushroom stems, chop and set aside. Place mushroom caps on baking sheet sprayed with nonstick spray, round side down. Bake 8 minutes or until softened. Meanwhile, tear each string cheese into shreds and roughly chop. Set aside. Remove sheet from oven but leave the oven on. Blot excess liquid (there will be quite a bit) from caps and set aside. In a small bowl, mix crushed tomatoes, garlic and onion powder. Equally distribute between mushroom caps and spread until smooth & even. Sprinkle shredded cheese over the sauce layer followed by mushroom cap pieces and turkey peps if desired. Bake for 10-12 minutes until cheese is melted. I have a confession to make… I don’t like Jif Peanut Butter. I’m a Skippy girl, always have been, always will be. But the other day at the grocery store, they didn’t have any of my beloved Skippy Reduced Fat. (I’m not a full-fat PB lover either.) So I opted for the Jif Reduced Fat instead. Right out of the jar, I immediately wasn’t happy. Skippy PB has a way of inviting you back for more, which is probably why the jar is always half gone the day I open it. I had a tablespoon of Jif on a piece of toast and to be honest, the burnt bread was the better of the two. Sad. Either way, last night, I was determined to use some of this peanut butter just to get it OUT of the pantry. Who knew that I would love the finished product? Every once in a while I get the urge to bake something out of ingredients I already have in my house. A lot of the time, I won’t have every ingredient a recipe calls for and I end up making a quick trip to the store just for a tablespoon of one thing. But yesterday, the whole jar of Jif Reduced Fat was sitting in my cabinet begging to be used. Begging. I also had a cylinder of Old-Fashioned Oats that haven’t been touched in a while. My idea? 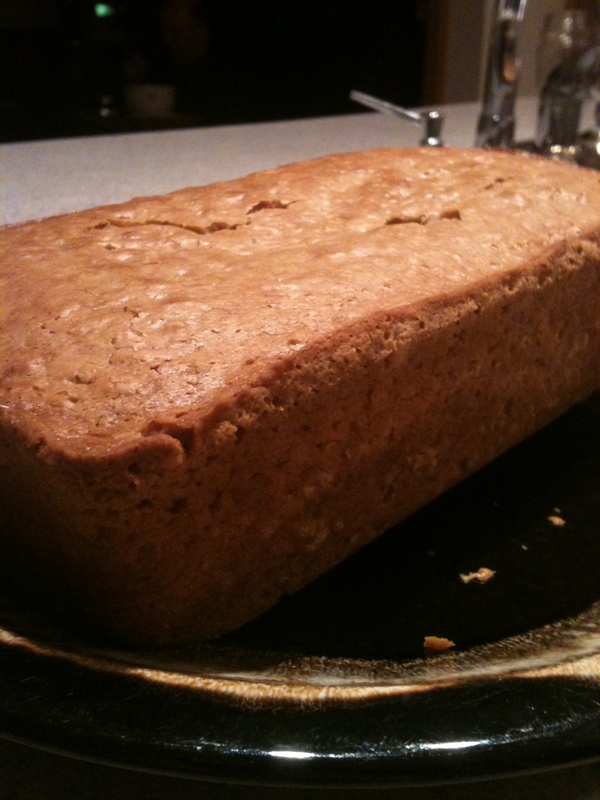 Peanut Butter Oat Bread. It was a simple recipe that made the whole kitchen smell like a toasted peanut butter sandwich. Divine. Chewy from the oats and loaded with peanut butter flavor, it’s more of a breakfast bread than a dessert but hey, to each his own. 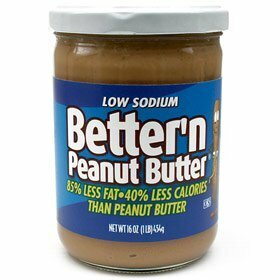 What’s your favorite peanut butter? Up there with Skippy Reduced Fat, I also enjoy Better ‘n Peanut Butter Low Sodium spread. Preheat oven to 350 degrees and spray a 9in x 5in x 3in loaf pan with nonstick cooking spray. In a bowl, combine flour, oats, sugar, Splenda, baking powder and salt. Add the peanut butter and mix until crumbly (I dug in with my clean hands). Bake in preheated oven for 55-60 minutes or until golden brown and a toothpick inserted near the center comes out clean. Hooray for Friday! 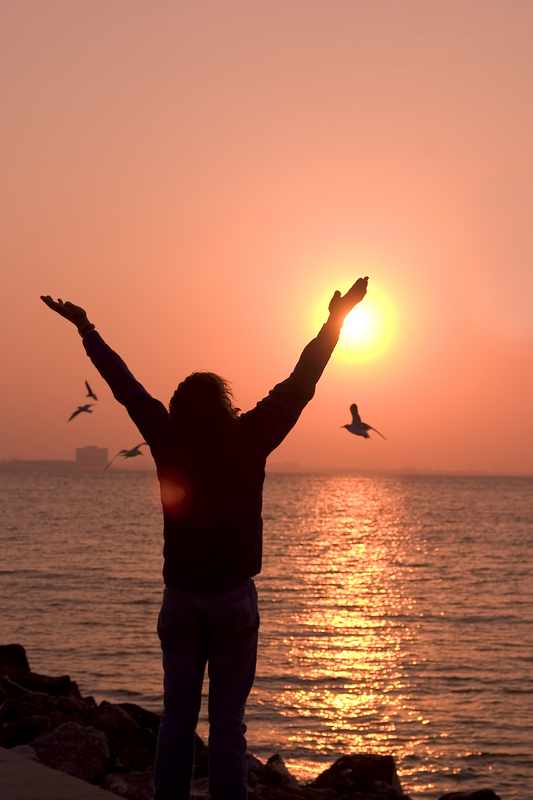 I know I’ve only had a 4-day work week (so spoiled..) but I’m really excited about this weekend. It’s Easter .. duh .. and that means spending time with my family, eating good food and being thankful… I figured a Friday Weekly Gratitude was appropriate. Thank you to my sister, Melissa. She’s home from college for Easter break and man, she’s a funny kid. She came with me to 2 nights of dance practice and totally showed me up in hip-hop. I told her to stop being better at it than me. She doesn’t listen. Thank you to Marathon Monday for giving me the day off from work and giving me something else to strive for. Those Boston runners are incredible! Thank you to the sun. It’s nice to finally see you. Would you mind warming the Boston area up just a bit more? Thank you to flip-flops. I’ve missed you. Thank you to my high school friends who have recently gotten back in touch. We’re getting together tomorrow and it’ll be so great to talk and catch up after a long time apart. Thank you again to the people I work with. The days go by faster and the crazors are a little easier to deal with because of you. Thank you to my Nuna for everything she has given me. Most recently paying my (very expensive) BU deposit. She is amazing. Thank you to my grandmother… another Easter with us and still going strong. She is the cornerstone of our family. We love you Grammy. Thank you to Easter Sunday. A day of love, family and faith. My Blogger Cards Are Here! At the Boston Brunchers event a few weeks ago, almost all of the other bloggers came prepared with their own cards. I felt a little out of the loop. Why didn’t I think of it before? Instead of googling aimlessly looking for sites, a blogger card (similiar to a standard business card) is one of the best ways to spread the word about your blog. Dur. I immediately went onto the VistaPrint website and started designing. I’ll admit I’m not the artsy-est person alive. I’m probably the least artsy person alive. Nevertheless, the website made it so easy. I found a design I liked, plugged in my info and clicked the “Send Order” button (with free shipping, of course) and that was that. Inexpensive, cute and perfect to give out to anyone and everyone! So I’ve been on a Hungry Girl kick lately. I want to make everything in her new 300 Under 300 cookbook and I’ve been trekking right along. Tuesday nights are my biggest cooking nights during the week because after work and the gym, all I want to do is make new recipes for my family. So far, they have turned out pretty well. I decided on a complex, no-noodle veggie lasagna recipe with so-simple-I-could-make-it-with-my-eyes-closed bacon & ranch chicken. I say the lasagna was a bit complex because it requires a good amount of prepping before the actual oven cooking begins. It was worth it. It takes about 30 minutes to cook at 425 degrees so when there was about 15-20 minutes left on the timer, I slid the chicken in too. Now, just a heads up about the serving size. Obviously, it’s one chicken breast per person but the lasagna also serves 4. When I read the recipe in the HG cookbook, it said 4 SUPER-HUGE portions. I didn’t believe her. I mean, an 8×8 isn’t that big. The portions can’t be that big either. How wrong I was. I couldn’t even eat the whole portion. You’ve been warned. Preheat the oven to 425 degrees F. Bring a large skillet to high heat and spray generously with nonstick cooking spray. Lay some paper towels next to the stovetop to drain excess liquid from veggies as they cook. Cook as many zucchini and mushrooms you can lay flat in the pan at a time for 2-3 minutes per side. Remove to paper towels. Continue until all zucchini and mushrooms are cooked, respraying in between each batch. Cook the eggplant 4-5 minutes per side, also respraying in between batches. Next, stir garlic powder and onion powder into the crushed tomatoes. 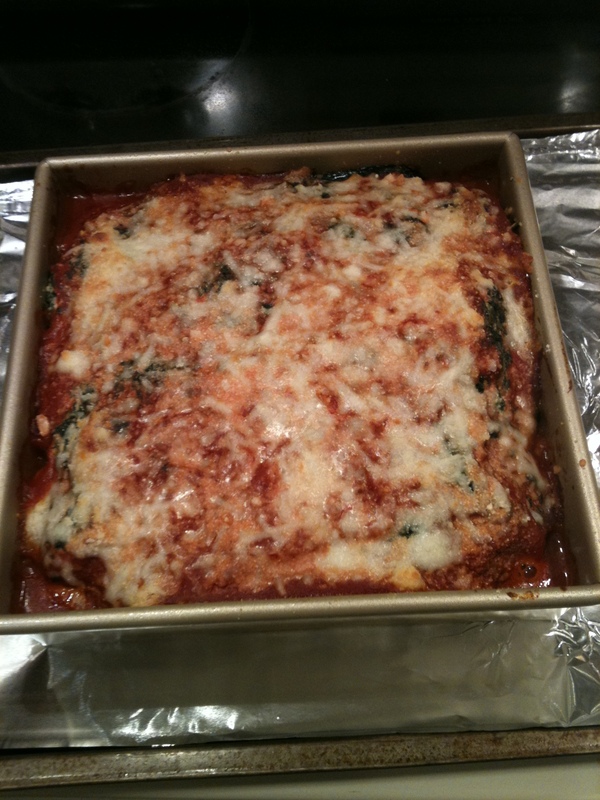 In a seperate big bowl, combine the spinach, ricotta cheese, salt, pepper and egg substitute and mix thoroughly. To assemble: Spray a deep 8×8 baking dish with nonstick spray. Even spread 1 cup of crushed tomatoes on the bottom of the dish. Layer half of the veggies over the tomatoes, eggplant first, then zucchini, then mushrooms. Top veggies with half of the spinach-cheese mixture. Lay the rest of the veggies over the spinach-cheese mixture in the same order as before, followed by the rest of the spinach and cheese. Top with the remaining crushed tomatoes and spread evenly. Sprinkle mozzarella cheese and parm-style cheese over the crushed tomatoes. Place on a large baking sheet and pop in the preheated oven for 30 minutes, until heated through and the cheeese on top is bubbly and golden brown. Spray a small baking sheet with nonstick spray. Lay the chicken on the sheet and spray the tops with nonstick spray as well. Rub 1/2 TB of ranch mix on each breast, front and back, and repeat with 1/2 TB bacon bits for each. Lay flat on the baking sheet and bake in preheated oven until cooked through and tender, 15-20 minutes. 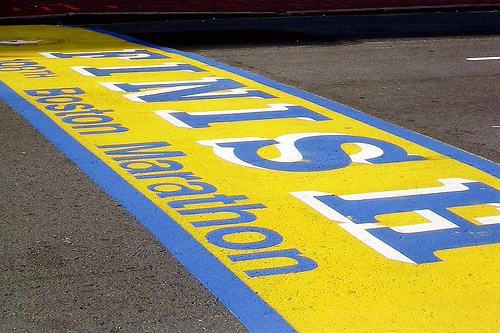 Just a quick post to say CONGRATULATIONS to all who ran the Boston Marathon today. When I went into Boston for dance practice tonight, I saw lots of black and green Adidas Marathon jackets, medals, and accomplished, happy faces. I won’t lie – I was SO jealous. It was on the way home from practice on the train that I made a hasty but doable decision.. I know, I know… it’s a far off dream, but it’s a dream nonetheless. I want to be part of the very small percentage of the human race who runs those 26.6 miles, up heartbreak hill, through whatever New England weather has in store for them. It may not be soon (baby steps, people, baby steps) but someday, I will run that marathon and cross that finish line. Someday. 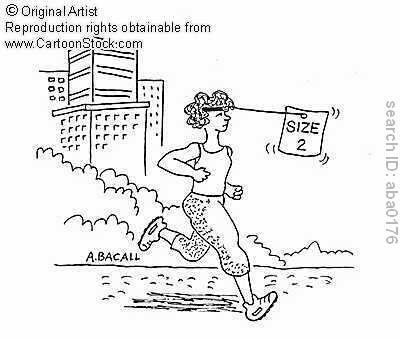 Today’s training: Walk 5 minutes, run 10 minutes, walk 3 minutes, run 10 minutes, walk 7 minutes uphill. Total: 35 minutes. Followed by some weight training/circuit training and I have GaGa rehearsal tonight. 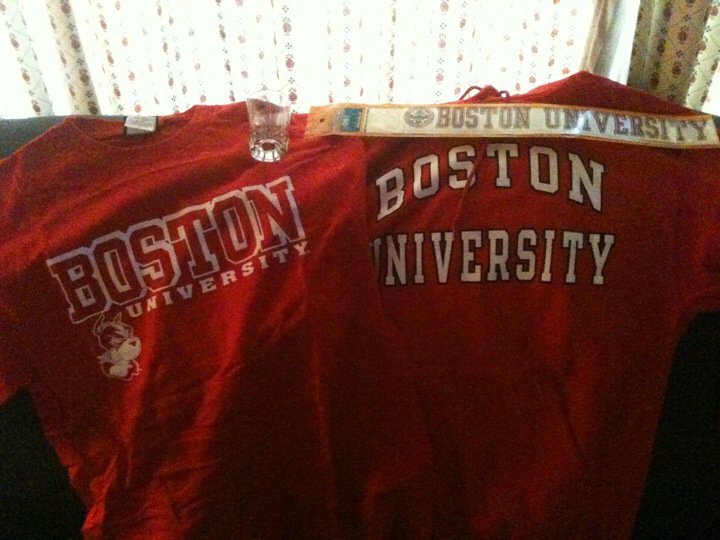 Oh and thanks to BU’s Accepted Student’s Day tomorrow, today is my Friday at work. This past weekend, I decided to forgo sleeping in until 2pm and managed to pull myself out of bed early enough to have a productive two days. On Saturday morning, after an quick and easy breakfast of a banana and my favorite yogurt (Light & Fit 80-calorie Vanilla! ), I watched the tube for a bit before completing a Jillian Michael’s workout DVD and taking a quick jog around the neighorhood. Sweaty and pumped up, I showered and decided to grab a coffee and visit my Grammy. During my visit, my Aunt Deb reminded me of the KitchenAid Stand Mixer (the one that was my Grammy’s that she was giving to me) and I noticed it sitting on the kitchen table. I had completely forgotten about it (seriously, how could I?) I dragged it home (it’s a heavy sucker) and immediately began figuring out ways to use it right then and there when an opportunity presented itself.. more about that in a bit. My boyfriend, Stephen, and I had made plans for Saturday night to cook dinner together at his house and spend the night drinking wine and watching movies. When our parents caught wind of this, they decided to join in the fun (and gave me an excuse to make chocolate cupcakes with buttercream frosting in my new mixing toy.) Let me preface – my parents and Stephen’s parents get along well, really really well. Like they’re best friends. I don’t hate it. When Stephen mentioned to me that his mom had a Weight Watcher’s recipe for Turkey Chili, I knew it was going to be a good dinner. Unfortunately, he and I planned on (and executed) a double batch of the stuff before realizing that our parents ordered pizza instead. Minor blunder. The chili, which we added extra veggies to on top of what the recipe called for, was hearty, warming and simply delicious. 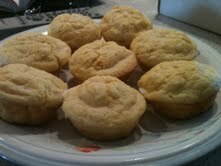 I made Hungry Girl Cornbread Muffins to go with it. Oh and the cupcakes? Hungry Girl’s recipe (I know, I’m on an HG kick. I love her, what can I say?) for simple chocolate-y cupcakes and my own simple buttercream. I dusted some green sugar sprinkles over the top. For some reason, maybe the use of the mixer or maybe I just didn’t add enough powdered sugar this time, but my frosting was, well… very thin, this time around. Still delicious and very shiny but not the thick buttercream I am used to. Oh well, they got eaten anyway. I spent the rest of the night drinking a new red wine, Black Opal Cabernet (circa Australia 2009), which was deep and full with cherry flavor. It defintiely wasn’t my favorite of all time but for approximately $7.99 and a night with the fam, I would drink it again. It paired nicely with the chili anyway. Waking up Sunday morning posed a bit more of a dilemma. I pulled myself out of bed around 8:30, called Stephen to make sure he was awake, made him promise me that he would be ready for the gym when I picked him up in an hour and sleepily made my way downstairs. Since I don’t like to eat heavy before the gym, I grabbed an apple and plopped on the couch to watch Hairspray. Before I knew it, I was changing into my gym clothes and getting my iPod ready, all the while the Couch to 5K Week 5, Day 3 lured – no, haunted – every thought in my mind. At the gym, we met up with our two friends and I immediately hit the tread. My friend Kimmy is using the Couch to 5K training plan too but the lucky bi-otch is in the early stages where you run 90 seconds and walk 2 minutes. Man, I miss those days. I began with my 5 minute walk that ended all too quickly. With my music set and my sweatshirt covering the timer, I kicked my run into a higher gear (approximately 10:54/mile) and just ran. 20 minutes later (my quota for the day), I was sweaty, out of breath and feeling GREAT. I even got high-fives from Kim during the last 2 minutes because I thought my lungs were going to explode. But overall, I felt accomplished and was elated telling Stephen and Kim’s boyfriend, Matt, about my epic run. Yes, epic. Whatever – it was epic to me. After parting from the other couple, I dropped Stephen off at his house and went home to shower. I spent the rest of the afternoon in the Boston University Barnes & Noble in Boston with Kim… aka wandering around the BU section trying to decide what to buy. 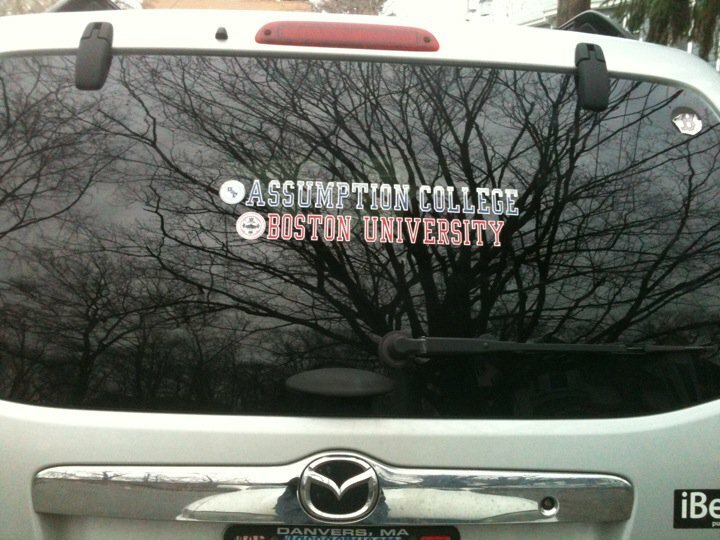 I finally decided on a red t-shirt, a red sweatshirt, 3 car stickers and a shot glass. Grand total: $80.. well played BU, well played. At least my car looks cool. That night, I went back to Stephen’s (I kinda like the kid…) and we watched Little Fockers with his parents and sister, Nina. It was hysterical; go rent it. Overall, it was quite a successful and productive weekend. Hopefully next weekend will be too! 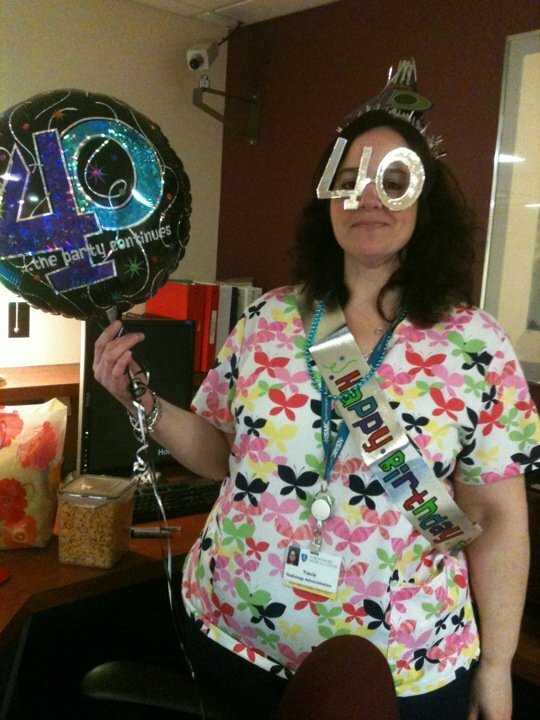 Oh – by the way, today is my friend/co-worker, Tracie’s 40th birthday. Brown turkey in large pot sprayed with non-stick cooking spray. Add all vegetables and canned items and stir to combine. Bring to a boil, stirring occasionally. Lower the heat and let simmer at least 1 hour. Serve hot with cornbread muffins. If desired, sprinkle parm cheese over individual servings. Combine flour, cornmeal, Splenda, sugar (if using), baking powder, and salt in a large bowl. Mix well and set aside. In a seperate medium bowl, mix corn, egg substitute, and yogurt. Whisk thoroughly. Add contents of medium bowl to the large one and mix until completely combined. Bake in oven for 15-20 minutes, until a toothpick inserted into the center comes out clean. Allow to cool and enjoy.